Edamame has lots of healthy fat, like avocado, but it’s also very high in protein. Hear that, protein-worried parents? Your kids will gobble this up and beg for more. In addition to fat and protein, edamame boasts omega-3s, a high fiber content and variety of micronutrients, including folate and manganese. And did I mention it’s delicious? Alright…I’ve made my case. Try it and see if you agree! Add the edamame to boiling water and cook five minutes. In a large food processor, combine the olive oil, lemon juice, liquid aminos, salt, and garlic. Blend thoroughly until the hummus has a smooth, creamy texture, adding more water— a tablespoon at a time—as needed. 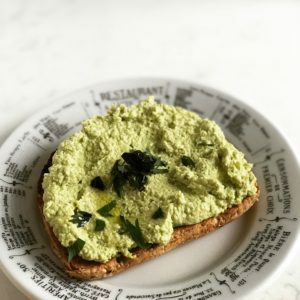 There is no end to the number of ways you can use this hummus: as a dip for vegetables, condiment for tacos, sandwich topping, or simply spread on toast and topped with herbs and lemon zest. You can easily vary this recipe by adding a bit of sesame oil, fresh herbs, spices, vegan Worcestershire, etc.—whatever your heart desires. Your support helps make it possible.